Prominent & Leading Manufacturer from Pune, we offer safety tapes. We are one of the prominent manufacturers, traders and retailers of an extensive range of optimum quality Safety Tapes to our valuable customers. The offered tapes are manufactured from pressure-sensitive adhesive vinyl film materials, which are sourced from authorized vendors. 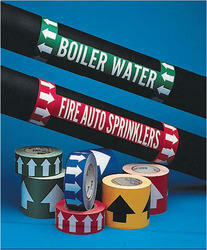 Manufactured in conformity with the industry set standards, these tapes are ideal for indoor and outdoor applications. Looking for Safety Tapes ?